Tricia Hutton, a local mom and new educational consultant for Discovery Toys, is celebrating her grand opening this month with an open house party and exclusive give-away for saskmom.com followers. "Discovery Toys was founded in 1978 to help children grow through play," Tricia explained. "Multiple layers of learning are incorporated into each toy, along with the highest safety and quality standards." Before she moved to Saskatoon a couple years ago, Tricia worked as a home visitation worker in Alberta. She was able to share information and resources with parents to encourage age-appropriate developmental learning. It is a role that she enjoyed and that prepared her for a career with Discovery Toys. "I chose to become an educational consultant with Discovery Toys because I enjoy sharing the value of play with parents," Tricia said. "I like to encourage parents to aim to play with their children for at least 30 minutes each day." Tricia said the Discovery Toys business opportunity also allows her to build a work schedule around her family's needs and her coursework as she completes her final year of a bachelor's degree in social work. Tricia will be hosting her grand opening party on May 18, 2010, from 7 to 9 p.m., at 302 Douglas Crescent. 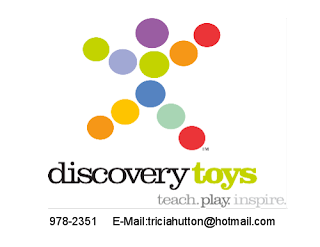 Those who attend will have the opportunity to play with a variety of the Discovery Toys. In addition, Traci Bakker from Epicure Selections will also be in attendance with the new spring product line. E-mail Tricia for more information. 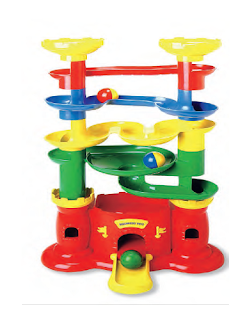 To celebrate her grand opening, Tricia is giving one lucky saskmom.com follower a Castle Marbleworks toy, valued at $45. This toy is recommended for children two and up. After they build the castle, children have fun dropping the weighted chime balls down the tracks as they learn cause and effect. You may enter this give-away twice. To enter, share your first name and your favourite activity to do with your children. Earn a second entry by joining Tricia's Discovery Toys on Facebook and letting us know below. Entries will close at noon on May 18. At that time a winner will be selected through Random.org. Click the link below to enter.